Crazy first week back after New Years 🙂 What fun we had with our Australian friends at the beach and in Tahoe! Trying to catch up on lesson plans for everyone. And in the midst of college stuff with my oldest daughter. Pray she gets some more choices for schools. She got her number 3 choice in December so she is happy. Hope you all are having a wonderful start to your New Year! 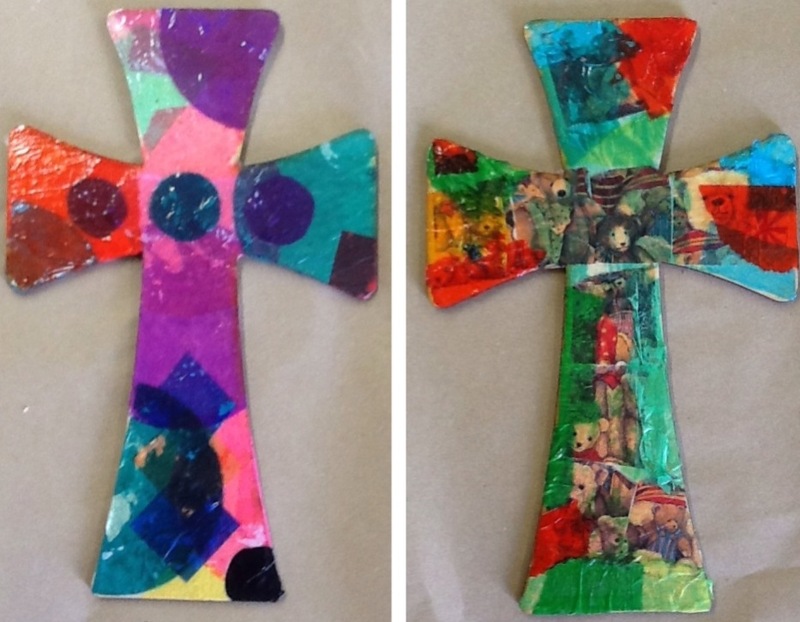 Start by showing the students crosses and discuss history of crosses. Next discuss how to overlap and make a collage piece. Be sure they put loads of glue on cross to hold down tissue and then put some on top at the end to ensure it sticks. Also make sure they cut or put all tissue ont op of cross to ensure it does not go off end of it. Once they dry glue or nail metal hanging piece on back and they are ready to put on the wall.